We know which live chat services people switch to because we run a unique screen sharing startup that integrates with live chat tools. Olark is one of the Intercom competitors that they move to. We use Intercom ourselves and we know the cost. For a small team, especially one with lots of users and low cost software, it can become expensive. Below, we cover Olark, which is one of the systems that companies switch to and is a good alternative if your main need is for core live chat features. Olark does not itself do onboarding email sequences, it focuses on live chat. It has both a very loyal user base and exceptional customer support. Olark was founded around 9 years ago and has a solid foundation as a live chat service with a large user base. What size team is Olark for? Olark is focused on solutions for smaller teams. While they have several larger customers who’ve had great success with their product, most of the customers have fewer than 10 agents on chat. It’s priced per agent, rather than fixed feature tiers, and the lower overall price point make Olark an accessible option for smaller companies. $17 per agent billed monthly, $15 / agent billed annually, $12 / agent billed bi-annually. How simple is the set up? Olark appears to be designed first and foremost for a non-technical user as a small team shouldn’t need a squad of IT experts to set it up. You copy and paste their code to get going, that’s quite standard for most live chat services but their integration pages also make everything very simple to get started with. See the Mailchimp integration page as an example. Like Intercom, Olark have a Slack integration to support agents who are juggling chat with other responsibilities. It’s built for sales and support, this is best reflected in their suite of integrations, which include both support software (helpdesks like Groove and Helpscout) and sales and marketing software (Hubspot, Salesforce, Mailchimp and more). You know that feeling you get when every email and every interaction feels right? That’s been our experience with Olark. They give a damn. Their customer service team is technically savvy, deeply respected and go above and beyond to help customers. The entire customer support team is all in-house, they don’t outsource any of it. They won a Stevie Award for customer service last year, and are finalists again in 2018. What’s the one key difference between Olark and Intercom? Olark does not do the onboarding emails that the Intercom messages (aka ‘Engage’) module does. Intercom, in some ways, is a CRM and drip email tool as much as it is a live chat tool. Olark focuses on live chat and provides 3rd party integrations to do the emailing. If you have an e-commerce site or SaaS company then check out Re:amaze.com. It’s a surprising service as the details are so good and the customer support is incredible. They give a damn. Check out some of their shopify integration reviews. What are the benefits of live chat compared to other forms of messaging? #№1 Add-on for LiveChatinc. See the User’s Screen. 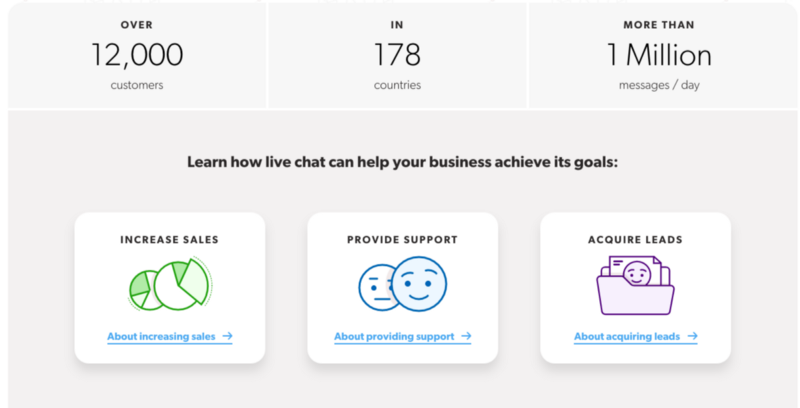 How much does live chat increase conversions?